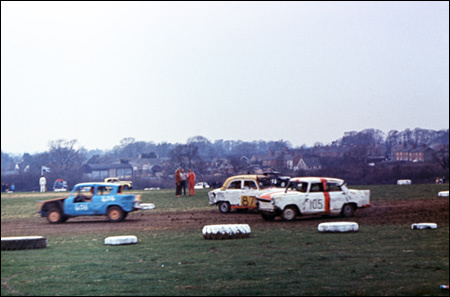 For a short time in 1972, Burton Wold was home to "Banger Racing" as a series of old (and disposable) cars, fitted out for racing (and collision) were pitted against one another by their enthusiastic drivers. 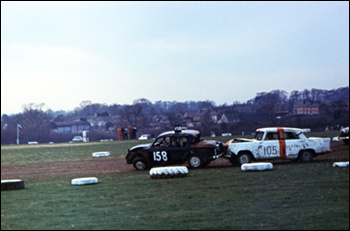 In the 1970’s ‘Banger Racing’ was held regularly in a field up Wold Lane, which is now cut through by the Burton Bypass and which was at that time farmed by the late Mr Robin Attfield. Later on the site moved to a field off Cranford Road  on the other side of the Bypass and on the left-hand side almost opposite the Windmill Cottages. Saturday afternoon was taken up in preparation for Sunday’s race day. The banger car, which was usually purchased very cheaply for between £5 and £10 and was no longer considered roadworthy, had to be stripped out inside and fitted with metal roll bars to form a cage to prevent the roof from caving in should the car be ‘rolled’. The vehicle also had to be fitted with a safety belt for the driver to prevent him (as far as I can remember there were only male racers at that time) from being prematurely ejected from the driving seat. Obviously all the windows had to be removed and a small petrol tank was fitted which only held sufficient fuel for about 20 laps (this was usually about a gallon) for safety reasons. The radiator was moved from the front to the rear of the vehicle to avoid it being damaged by contact with other cars. The car was usually painted in bright colours and carried the number of the driver for identification purposes. Sunday morning still saw last minute preparations being undertaken. The vehicle had to be loaded on to a trailer, together with all the necessary accessories such as petrol can, tools, overalls, goggles etc. ready to be off in time to catch the first race, which was about 2 pm. The car was then attached, wife and children bundled in and, together with the chief mechanic ‘Ginger’ (who was at that time only 15 years old) we would set off  very often in some sort of panic - when it was realised that something still needed attention. Once registered  you could enter as many races as you wanted. 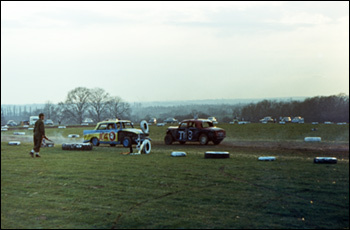 Vehicles had to be repaired between races and provided you did this and the car was race worthy and still had 4 wheels you could continue to take part. 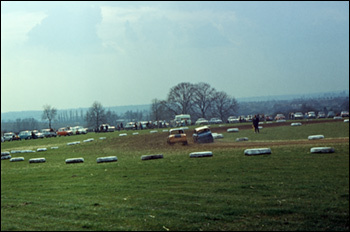 Each race ranged between 10 and 20 laps of the circuit. There never seemed to be much in the way of ‘rules’ as I remember. The first car to be mobile and on the grid had pole position. The main idea was to disable your opponents’ cars in order to be the winner. After the preliminary races had taken place, the final was held and the winner awarded a ‘trophy’. The final race of the day was a ‘Race to the Death’, which involved all cars taking part being knocked out until there was only one remaining. I remember winning on one occasion but on others I often ended up upside down inside the vehicle. Often the car was beyond repair and it was then left for the scrap merchant to tow away. It was always a filthy sport. In the summer when it was dry the dust would get into your eyes, hair and all over everything. On wet days the mud would be equally troublesome. 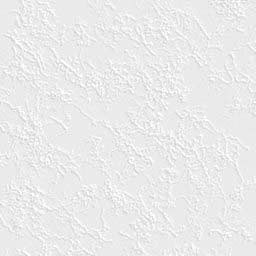 We (the kids included) always went home plastered and my poor wife had to set about bathing the boys before we could do anything else, and then had the task of washing all the dirty clothing. Nonetheless, it was an enjoyable hobby - although I’m not sure what the Health and Safety Executive would think these days! 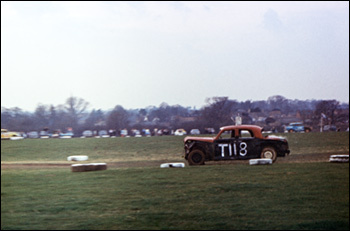 Were you there at the Banger Racing on the Wold or up Cranford Road? Did you drive in the races? Have you got memories or photos you can share with us?